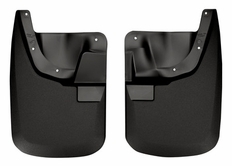 If you’re looking for a set of mud guards that are superior to the competition, you’ve come to the right place. Husky Molded Mud Guards, made by Husky Liners, offer a superior fitment because they are designed specifically for your vehicle. Because of this, Husky Molded Mud Guards fit better, look better, and offer superior performance. You’ll get a wider and longer mud guard when you go with Husky Mud Guards. Additionally, unlike universal mud flaps, they will install perfectly every time and with ease since these mud flaps come with all necessary hardware specific to your vehicle, as well as installation instructions. Because Husky Molded Mud Guards are made from highly durable thermoplastic, they will stand up to the weather and any additional beating you put them through. Sold as a pair, your Husky Mud Flaps are backed by a lifetime warranty so you can rest assured that they’ll be hard at work for as long as you own your vehicle. The part number for this item is 56681 and it fits 2011-2015 Ford F350 F450 SuperDuty Dually (w/out Fender Flares) models. *Vehicle specific molding means superior fitment. *Backed by a limited lifetime warranty.